Join the discussion on our forums! 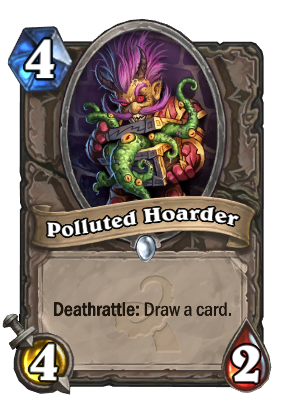 Come discuss Polluted Hoarder over in our dedicated Polluted Hoarder discussion topic. This would've been a better card if it was a 4/3. Maybe also instead of drawing a card, it should summon a 2 cost minions when it dies Kappa. Are the devs surprisingly clever with puns, or is this a coincidence, I wonder. this card would be good in a reno deck for card draw since you dont want to run two loot hoarders because reno, so I see the value there but its nothing special, not gonna be a meta changer, you'll probably see this card once in awhile, but honestly i'd just run acolyte instead. Seems like a neat idea. Kind of like how Darnassus Aspirant works. If this card is so trash compared to inventors, Why am I seeing more Evil Heckler than shenjin shield mastas? this trades up, neither unpolluted hoarder nor an inventor can kill a 3 drop. Or threaten 4 drops this can. A better comparison is to azure drakes, but they cost 5 mana. Because Evil Heckler is from a newer set so it shows up more in Arena. And yes, that's the reason, Shieldmasta is better. Though I do agree, I like this card. I really like the art. I hope he still says something (voice queue)in the lines of what the normal Loot Hoarder does, but with a more "corrupted" sound. draw two cards would be so op and autoinclude in many decks. I think the Card is too expensive for its effect plus stats. The normal loot hoarder gives you 2/1 stats plus a deathrattler effect for 2 mana. The new Card doubles the stats but the effect keeps the same. I understand that draw 2 Cards would have been two strong but making it a 4/3 minion would have been justifyable. Maybe it was done to Keep it balanced with respect to Gnomish Inventor but I feel like an instant Card draw is worth more than one caused by deathrattle since it could be prevented. Additionally i never really liked 4/2 stats because they will neither trade upwards or downwards very efficiently (dies against small creatuers, probably wont kill bigger creatures on its own). Reduce cost by 1?!? That's insane dude. Imagine Gnomish Experimenter always drawing a card. Increase hp by 1... maybe... feels too good still. And difference between 2 and 3 hp is negligible after turn 4 anyway. The really insulting part is that it dies to Loot Hoarder. Drawing a card and a random 2-cost minion are worth around the same thing. It wouldn't be that much worse than shredder, and in some game plans even better. Deathrattle draw 2 cards would be just dumb. Arcane Intellect + a free 1 mana 4/2.